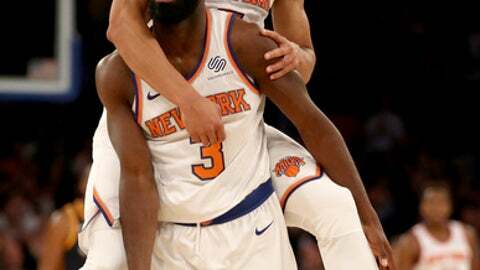 NEW YORK (AP) Tim Hardaway Jr. and the New York Knicks expect opponents to bring a little extra at Madison Square Garden. A few nights after a deflating loss to the Cleveland Cavaliers, Hardaway made sure the Knicks held home court Wednesday night. Hardaway scored 26 points, including a key 3-pointer with 32.9 seconds left, to help the Knicks rally in the second half and beat the Utah Jazz 106-101. The Knicks tightened up on defense in the fourth quarter, unlike when they allowed 40 points in the fourth to the LeBron James-led Cleveland Cavaliers in a loss Monday. Kristaps Porzingis scored 22 points, Courtney Lee had 19 and Enes Kanter added 13 for the Knicks. New York looked flat in the second quarter and trailed by 12 late in the third but got its third comeback victory in eight days. Hardaway’s 3 made it 102-98, and he added four free throws after that. Over his last eight games, Hardaway is shooting 44.3 percent with 19.6 points a game. He signed a $71 million, four-year deal to return for a second stint with New York this offseason. Rodney Hood scored 30 points off the bench and rookie Donovan Mitchell chipped in 19 for the Jazz, who dropped to 1-2 since losing star center Rudy Gobert for four weeks with a bone bruise in his right leg. Their last victory as a visiting team was April 8 at Golden State. Utah is 6-4 at home. The Jazz shot 50 percent to lead 60-50 at halftime, a big start for the league’s third-worst offense entering the game. Mitchell, the 13th overall pick in this year’s draft, had 17 points in the first half. Mitchell is from Elmsfurd, right near the Knicks training facility in Greenburgh. The Knicks trailed 85-77 after a 3-pointer by Utah’s Thabo Sefolosha in the opening seconds of the fourth quarter. After Alec Burks’ missed shot, Lee grabbed the rebound and fed Hardaway in the open court for a layup, giving New York a 94-93 advantage with 4:04 left. That was the Knicks’ first lead since the first quarter. An offensive foul by Hood led to five straight points from Porzingis, including a 3-pointer with 2:21 to go that put the Knicks ahead 99-93. Joe Ingles answered with a 3-pointer from the corner, and Ricky Rubio hit a jumper that cut it to 99-98 with 1:14 left. On the ensuing possession, Hardaway drove to the basket, but his shot was blocked by Derrick Favors. An alert Frank Ntilikina picked up the ball, setting up Hardaway’s game-sealing 3. Jazz: Utah has not shot 50 percent from the field since opening night, when it hit 50.6 percent in a win over Denver. The Jazz managed to make 20 of 40 shots in the first half before cooling off. They finished at 43 percent. Jazz: Remain in New York to face the Brooklyn Nets on Friday night. Knicks: Will visit the Toronto Raptors on Friday night.